�If you want a large hot pepper, you should try the new Hot Portugal. 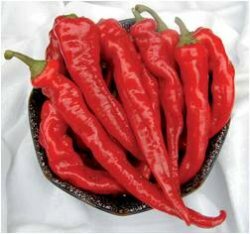 The best hot pepper we know.�-said one chili enthusiast Sturdy upright plants produce very heavy yields early in the growing season. Glossy vivid red elongated fruits grow 6" or longer.